It was free admission at the Children’s Museum of Tacoma today, so Jocelyn and I got out and had fun. We started our morning, of course, at Starbucks–sharing a breakfast sandwich and bagel with cream cheese. Then, it was off to the museum! 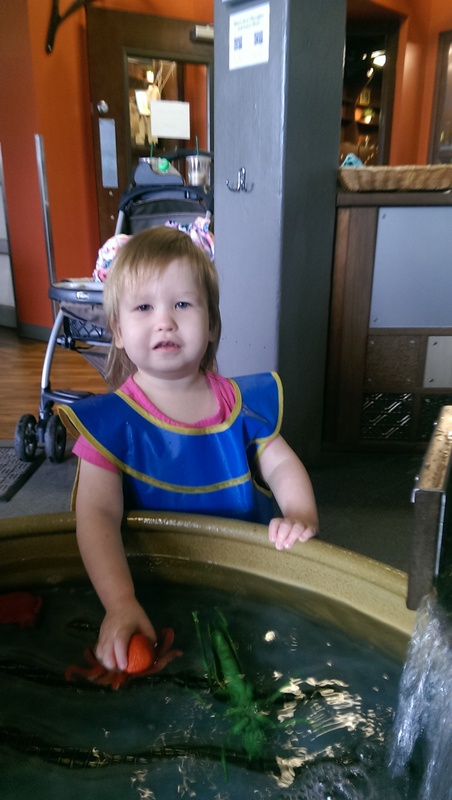 Jocelyn really enjoyed playing at the waterworks. In the water troughs were large plastic lifelike animals. One of Jocelyn’s favorites was the blow fish! She carried it around everywhere. It was nice getting out and giving Jocelyn the opportunity to play. It also was nice for me, for a change, to do something different and put a little more variety in my day. As a freelance writer, sometimes it’s hard to turn off my work mode and make it a priority to set aside time for breaks. Thankfully, Jocelyn reminds me daily of how important it is to get out, play and have fun! Writing that next story can wait.